Robots are not just meant for household jobs only. Now, a prototype model of the micro medical robot has been developed that can reside and travel inside a human body to eliminate or treat the affected part of disease especially cancer. The task was initiated by Japan’s Ritsumeikan University researchers who gave their best shots to develop this micro medical robot after undergoing three years of detailed research. 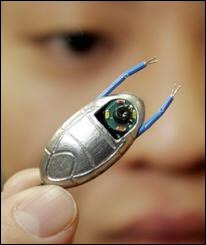 The beetle-shaped robot is 1cm in diameter, 2cm in length and weighs around 5-grams. To minimize the need for surgery, this surgical micro robot can affix diverse kind of medical devices such as micro camera, micro manipulators, various sensors and drug delivery injector. Though many other robots were designed and developed to send inside the human body or can be swallowed to take pictures but the technology applied to this beetle-shaped robot is only one of its kind.